First this posting should (will) be moved to be under the SIMS class CASF thread. If you have not looked in the SIMS class CASF thread, I recommend that you do so. Getting good views in the area behind the bridge and before the stack, of not only this destroyer, but pretty much ALL destroyers, is really hard to find. I have looked at all the images I have, both drawings and photos, and I can't get a standard vent configuration for all the SIMS class units throughout their careers. 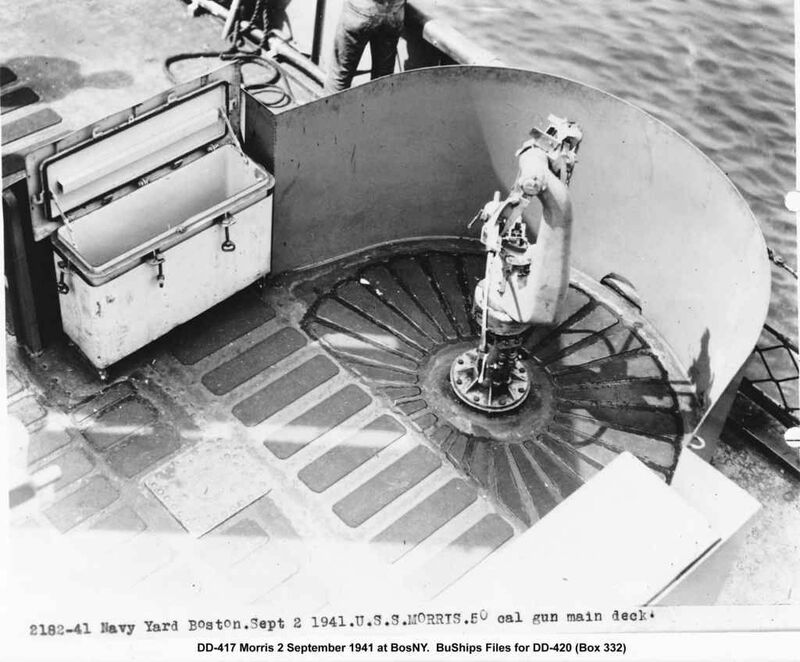 But, in the attached fitting out view of USS HAMMANN, it appears to me that the vent is one of the types that arc over so that the exhaust points to the rear with a blower on the side. 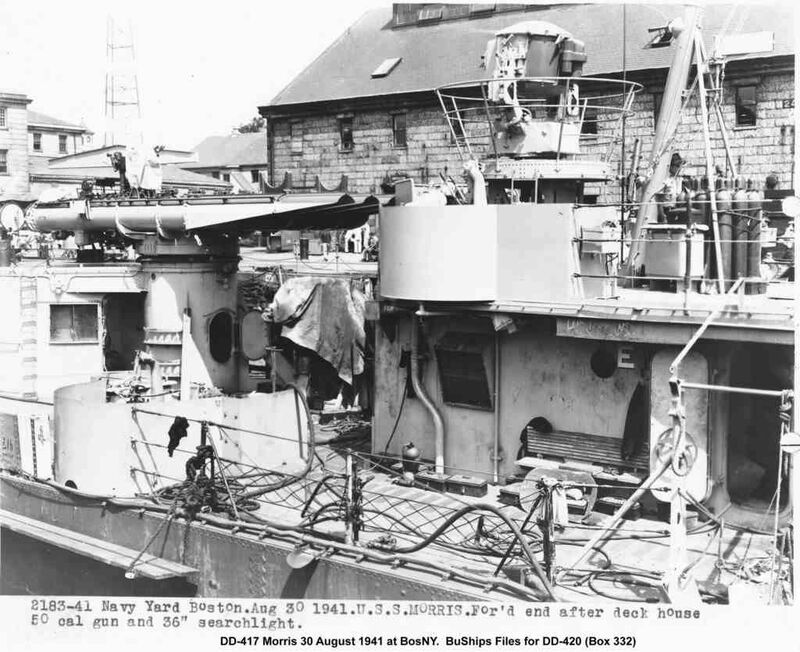 I don't have a good image looking down on the aft deckhouse for USS HAMMANN, but here is an image of a sister (USS MORRIS) with the same configuration before 20-mm guns replaced the 50-cal MGs. The vents either exit to the aft or continue to arc over so that the exhaust faces down. 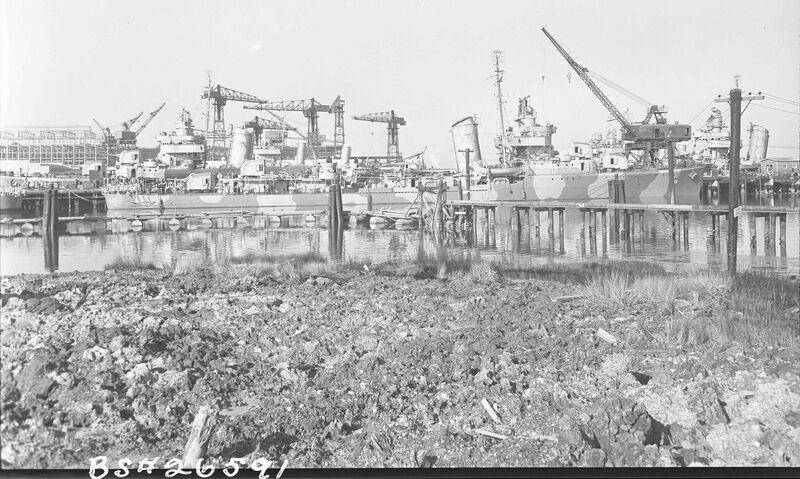 I finally located a set of what were missing prints at NARA of SIMS class destroyers at Charleston Navy Yard taken on 5 January 1942 when the units were upgraded with 20-mm guns prior to going to the Pacific. These prints were missing in the BuShips (LCM-19) collection, but the negatives existed and I was able to scan them. Some of these images have been available as small images from other collections, with some available at NHHC as large file downloads. But not all of these are available. I just completed my 6th and final ISW 1/350 Sims class destroyer. As a result of the generous part replacement policy of ISW, I have a lot of parts sent in addition to ones I asked for. This includes 3 hulls that I used to test paints but are probably still usable if overpainted with primer. I can tell you how to straighten them if you wish to correct the approx. 10 degree L turn in the bow forward of the bridge. The spare parts include both resin and PE. Not all of them are Sims class not sure what kit the others came from. Some but not all of them mainly PE are already painted Ocean Grey. I have enough spare parts to probably build a complete Sims class DD. I am not selling these parts. If you need anything that came from this kit or the other DDs offered by this manufacturer feel free to rattle my cage via email direct to me. If the cost to send anything to you is over a few bucks I would appreciate a donation to my gin and tonic fund in the amount of the postage and padded envelope. This is not mandatory and I will absorb the cost if necessary to get rid of the spare parts and assist fellow model builders. To cover all bases I will be placing this message on the main forum, the Sims CASF site, and the Trading Post. If I do not hear from anyone by 12/1/17 most of these items are going into the trash. Ms 12R(Mod) started out defined using 5-S, 5-O, and 5-H, but 5-S was quickly changed to 5-N. So I have another question about the actual colors of Measure 12 (modified); ShipCamouflage.com lists the colors as Sea Blue (5-S) and Ocean Grey (5-O), but I thought Ms12 mod used Navy Blue (5-N) in place of 5-S. Any thoughts? So I have another question about the actual colors of Measure 12 (modified); [url=http://www.shipcamouflage.com/measure_12_modified.htm]ShipCamouflage.com lists the colors as Sea Blue (5-S) and Ocean Grey (5-O)[/url], but I thought Ms12 mod used Navy Blue (5-N) in place of 5-S. Any thoughts? And you can't look at her DesRon 2 sisters for a hint of SIMS' pattern. None of the nine units had the same pattern. Thanks for confirming Rick! At least this way I know there's likely no good images easily available. Perhaps one day. I have the photos of SIMS next to RUSSELL, but you can only see a few parts of the ship - I'll just have to infer the pattern based on other examples. Sorry, I missed this post somehow. It has been a busy week and next week will be even worse. Your assumption is about right, there just wasn't much opportunity for her to get in front of a camera. The only photos I have seen of USS SIMS painted in Ms 12R(mod) and scanned, are the ones taken alongside USS RUSSELL at Norfolk on 16 December 1941. And in those images, RUSSELL is the destroyer you can make out much camo detail. 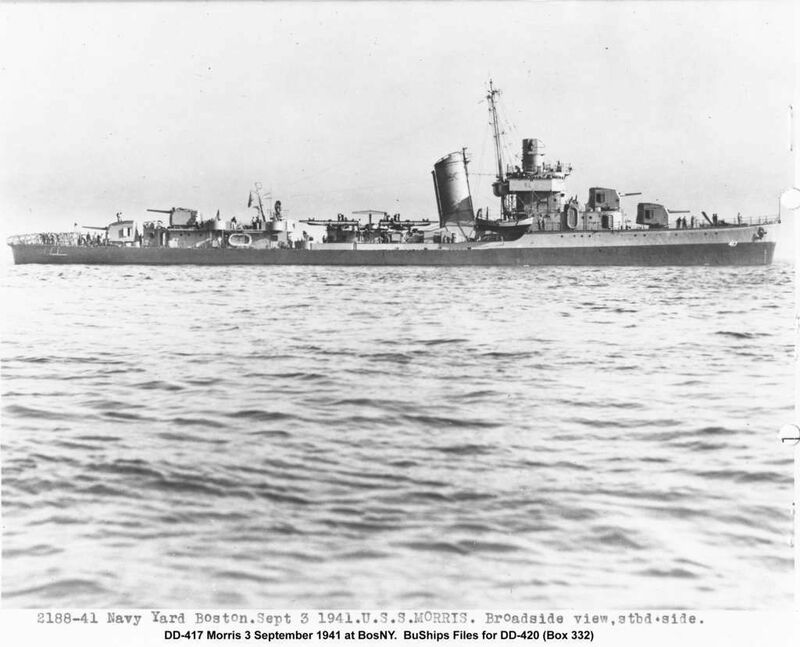 I have seen an image of SIMS sinking with USS NEOSHO at Coral Sea taken by an attacking IJN aircraft, but I can't even tell that it is a destroyer. 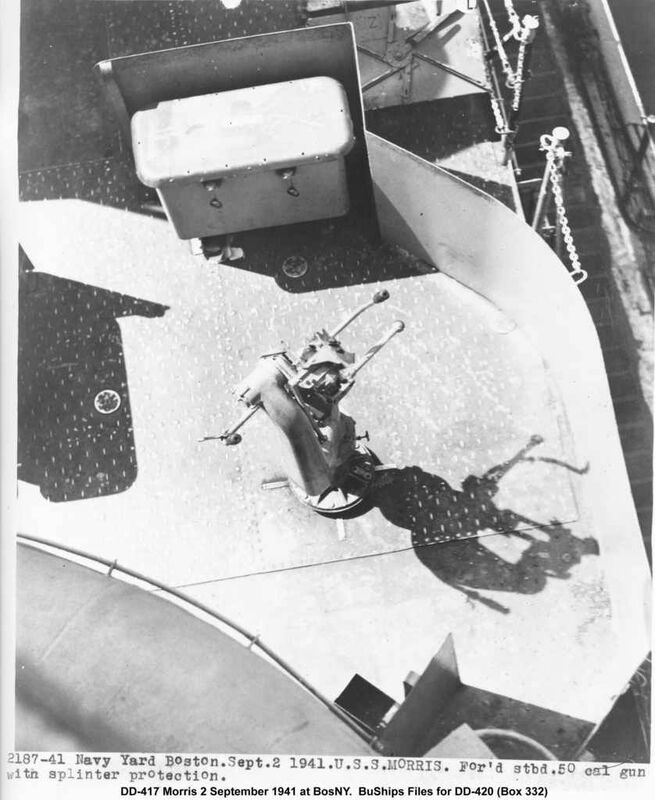 It is also possible that she is unidentified in the background of photos of USS YORKTOWN's TF ops in early 1942. But photos of YORKTOWN during that period are rare as well. I have gone through just about all the photo collections at NARA that I can think of that have original prints from WWII. There is still a possibility that there is (are) negatives without prints in their collection, but that would require a lot of effort like looking for that needle in the haystack. 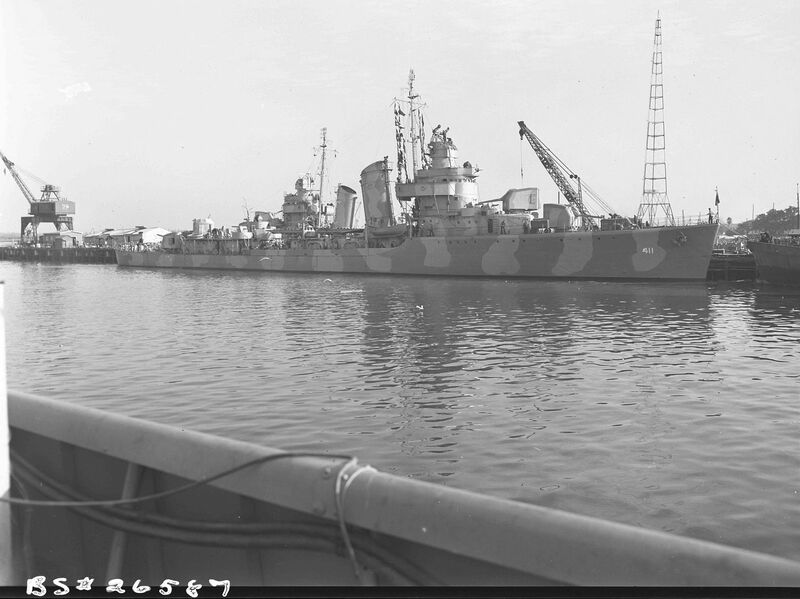 Does anyone know of any views of SIMS (DD-409)'s camouflage in 1942? 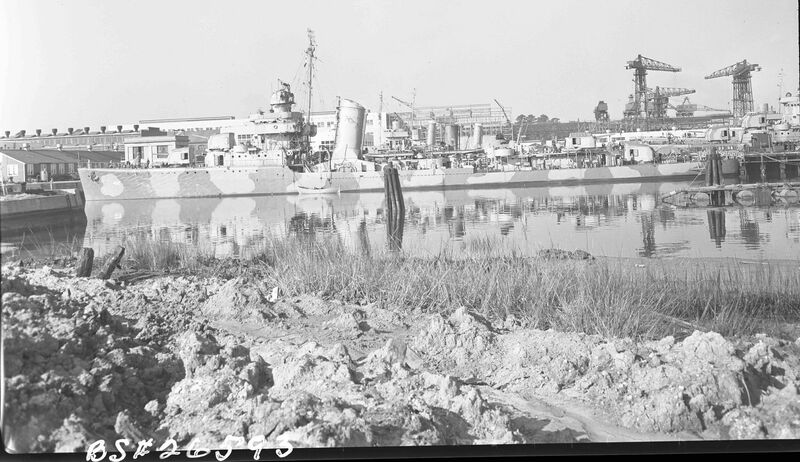 I've found a few photos on the NHHC website of SIMS and RUSSELL (DD-414) at Norfolk on December 16th, 1941, in Measure 12 (modified) - but these don't give much of an idea of SIMS' camouflage. I can't find any other photos of the ship in camouflage, only tons of pre-war photos. There are some somewhat random model kit lineart images floating around the internet but I don't trust those at all. I guess the ship did not live long enough to have many photos taken of its pattern. On my last trip to NARA a couple of weeks ago, I came across some photos in textual records that I never expected to find. 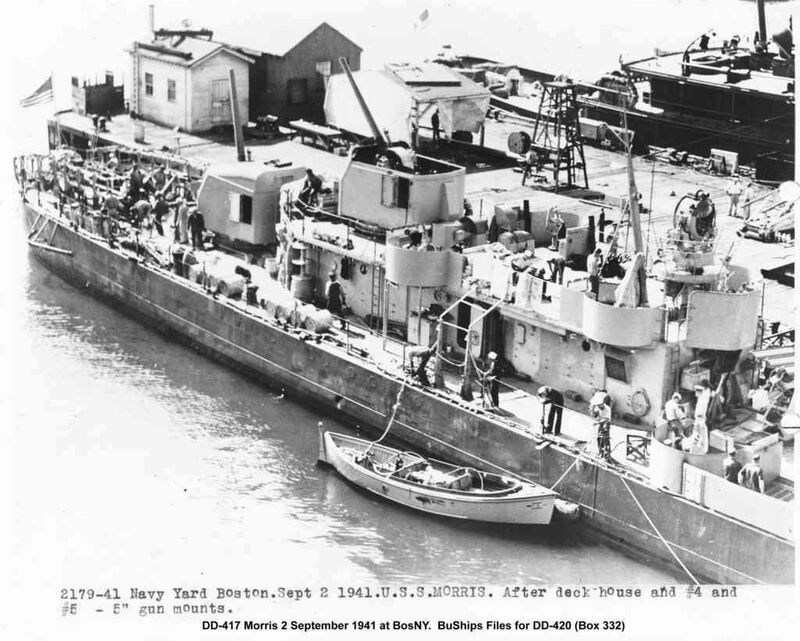 In the textual records for USS BUCK (DD-420) I found EIGHT photos of USS MORRIS (DD-417) and TWO of USS BUCK (DD-420) taken in August-September 1941 at Boston Navy Yard while these two destroyers were getting the King Board Mods done. 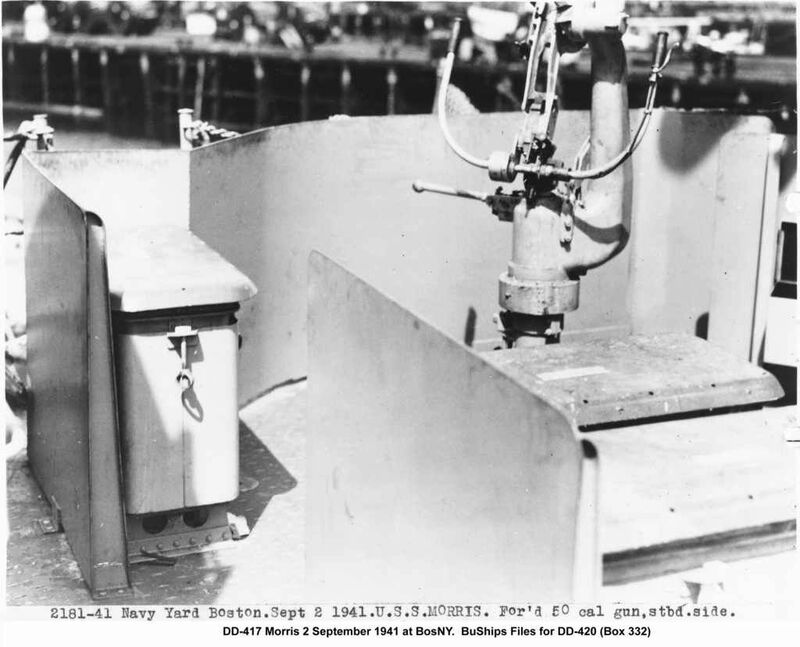 The King Board Mods were accomplished in at least two different configurations on the SIMS class when they cutdown the searchlight tower, removed the 53 mount, installed eight 50-cal MGs, etc. The other mod version retained the small searchlight tower deckhouse with the searchlight relocated atop it. I had never seen ANY onboard views of the SIMS class destroyers getting the initial King Board Mod configuration with eight 50-cal MGs. 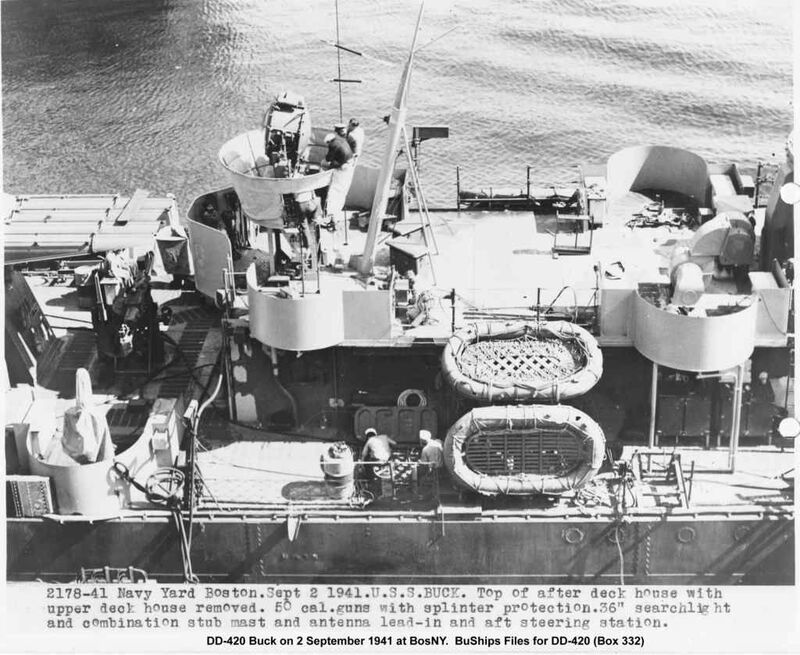 Out of these twelve photos, I had only seen one before, a profile view of USS MORRIS in stream show this configuration from a moderate distance dated 3 September 1941. Finding ANY in yard photos at Boston Navy Yard is very rare. These photos have a lot of interesting details for this mod that in many cases carryover to when the MGs were replaced with 20-mm guns in December 1941 and show that these two were being painted in Ms 12 original. No idea if 5-S or 5-N paint was used. 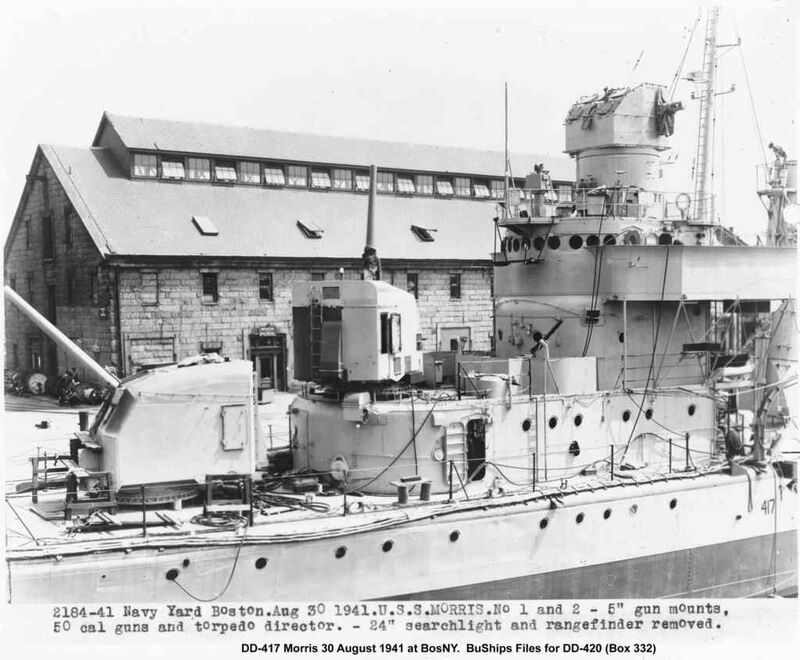 Note in the first image, dated 30 August 1941, that MORRIS has her hull number painted below her bridge on the hull. A WWI practice that was briefly used in mid-1941. 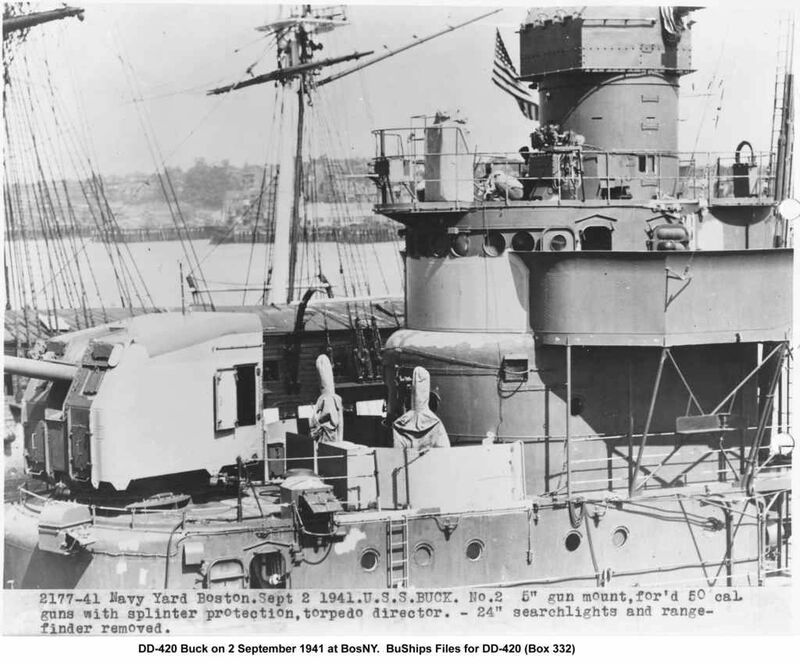 In the in-stream view dated 3 September 1941, her hull number has been applied in the conventional place on the bow. 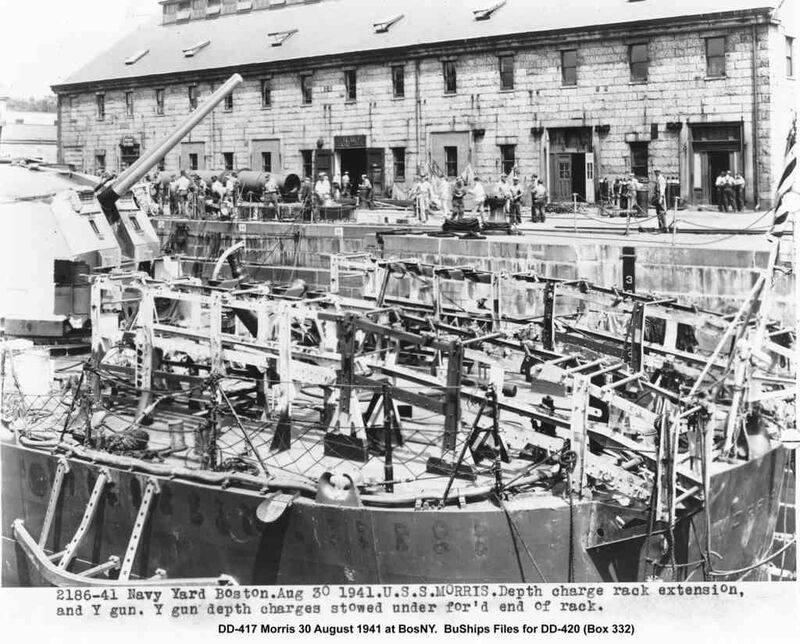 In the photos dated 30 August 1941, MORRIS is in Drydock #2 at Old Charlestown Navy Yard (Boston Navy Yard). This is the same drydock that USS CASSIN YOUNG was docked for repairs and that USF CONSTITUTION gets docked in for repair work. The building in the background of the four or so photos, is the current building of the USF CONSTITUTION Museum. That is generally a good course of action, actually on many Ms 12(R)mod destroyers anyway in mid-1942, doing a mirror of the pattern from the known side is "almost" a safe bet. And after a point many of the USN yards adopted a "common" style for the Ms 12(R)mod ... 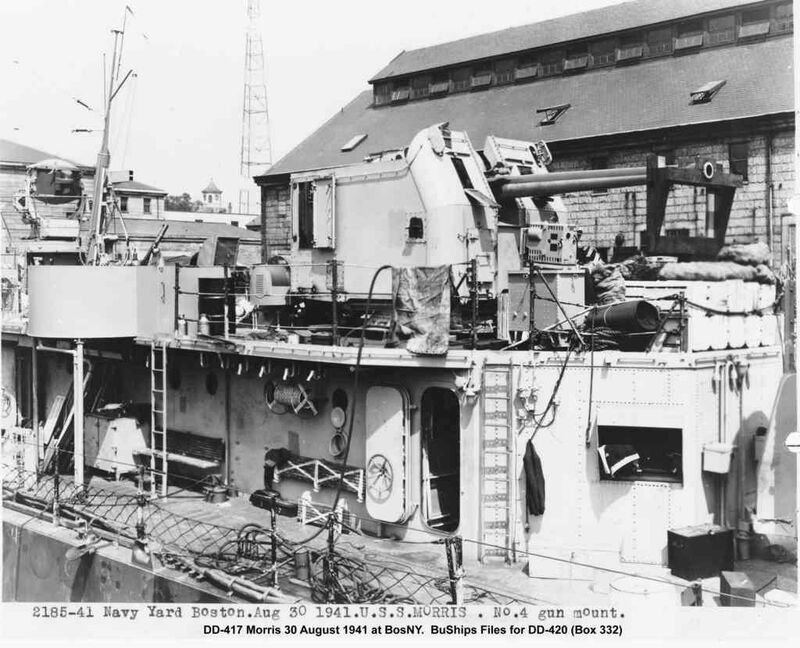 I can spot a Boston Navy Yard Ms 12(R)mod camo job pretty easily ... that was used nearly the same way of several destroyers. However, the DesRon 2 SIMS class destroyers are an interesting group in that there is hardly any commonality between the nine sisters. I have "partial" views of several of this destroyers taken at various times. There are some units that look like their pattern was slightly altered while in service during touch-up painting. But, as you say, take your best guess. If you wait to get the EXACT pattern, the unfinished model maybe sitting there for a long time. That is easy to solve. You simply paint the starboard side of your model in the pattern of a destroyer for which you have a view of the pattern on that side and paint the portside in the pattern of another destroyer that you have with a view of that side. You get to model two ships at the same time. Martin, what makes it twice as hard to model a ship in one of these camouflages is very seldom do we have photos of both sides. Great photo. 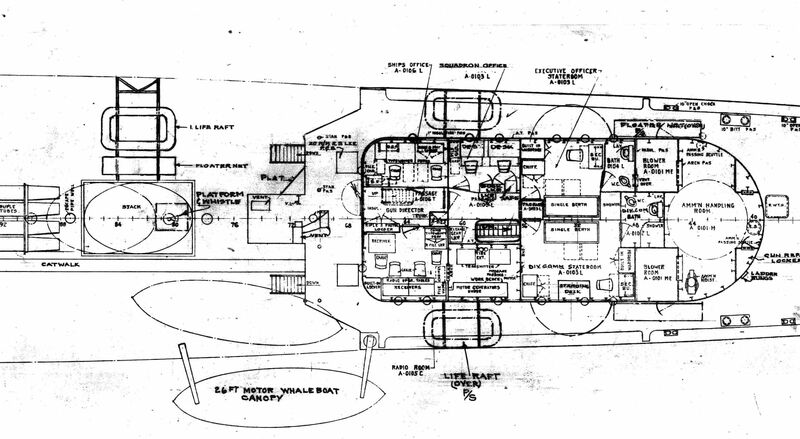 The Navy Yards had no consideration for future modelers when they painted these complex schemes. Didn't they realize how hard they were making it on us to replicate these? Here is a photo of WALKE taken after her refit seen in the earlier yard photos I posted above. 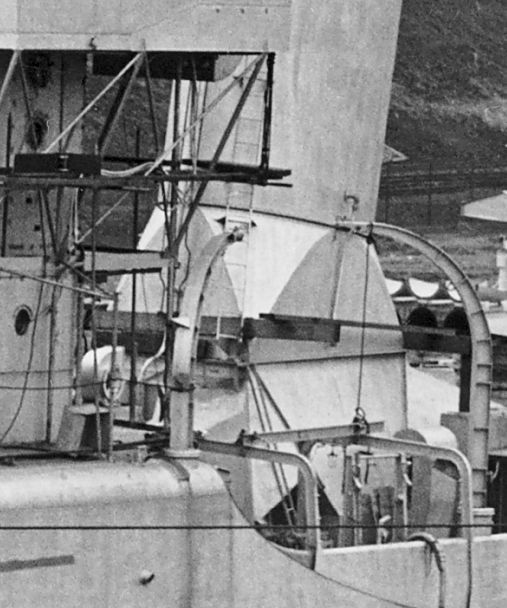 In this photo, the censor has removed all radar antennas, but it shows her portside camo pattern. 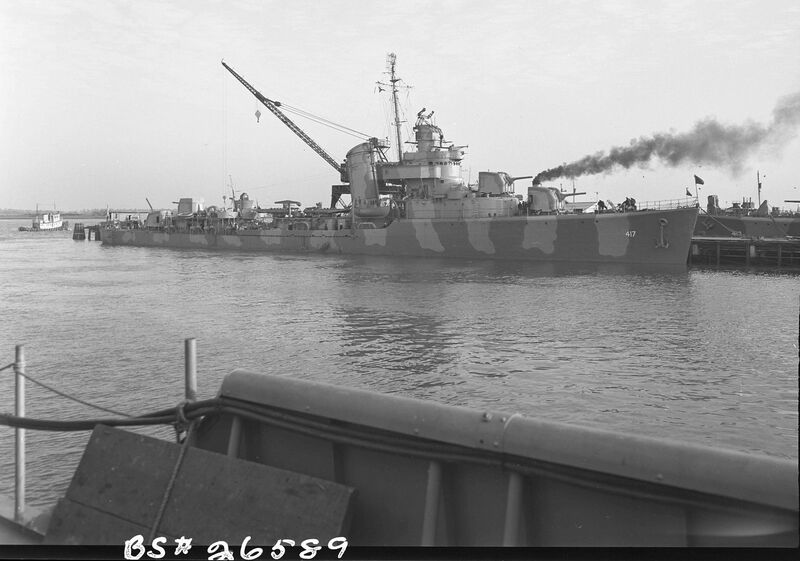 Another image of a SIMS class destroyer in late 1942. This photo has no date, nor does it say which ship the crewman is being transferred to. But, from the configuration the photo was taken after 1 August 1942 when her MINY refit was finished. Also, Fred Branyan found this image of HUGHES on-line reportedly taken just after the Battle of Santa Cruz. 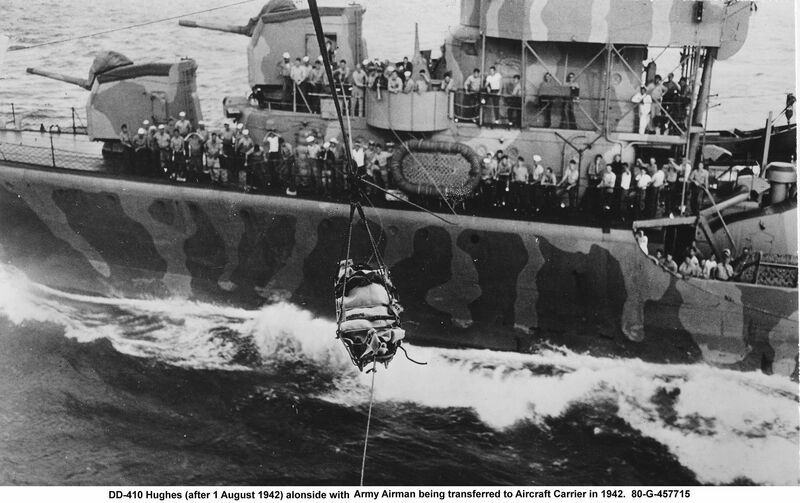 This photo shows a little more of HUGHES and based on the difference in wear and tear on the hull between the two photo, likely they were not taken at the same time. 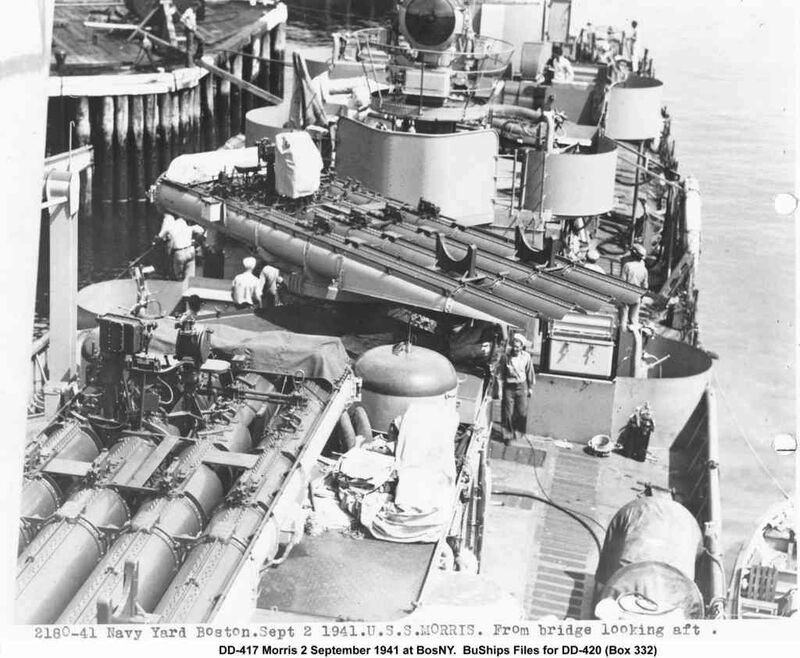 By her June-July 1943 overhaul RUSSELL had two twin 40-mm mounts on the aft deckhouse, with a single 20-mm gun on the small deckhouse aft of the twin 40-mm mounts and superimposed over the 53 mount. There were three 20-mm guns before the bridge, one on an elevated centerline platform. 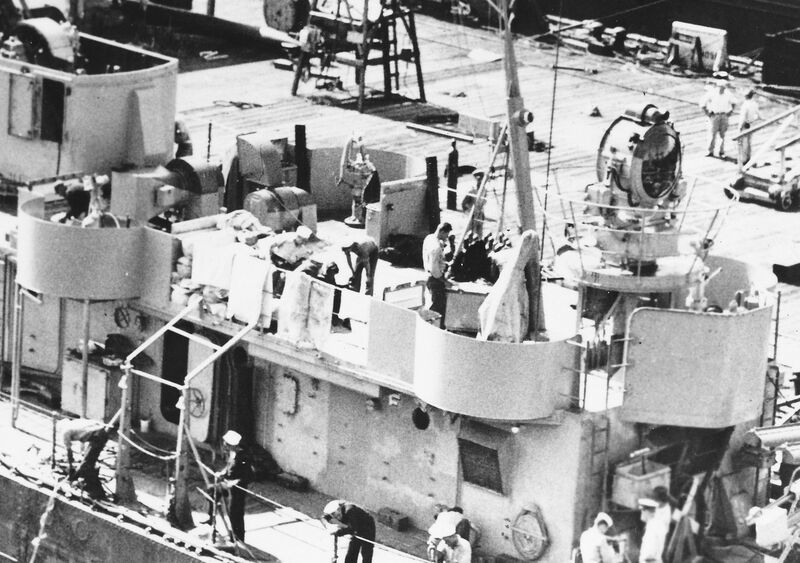 The two twin 40-mm mounts installations were pretty much standard for the surviving units of the SIMS class. The three Atlantic based SIMS class units had a different support arrangement for the Mk 51 directors. 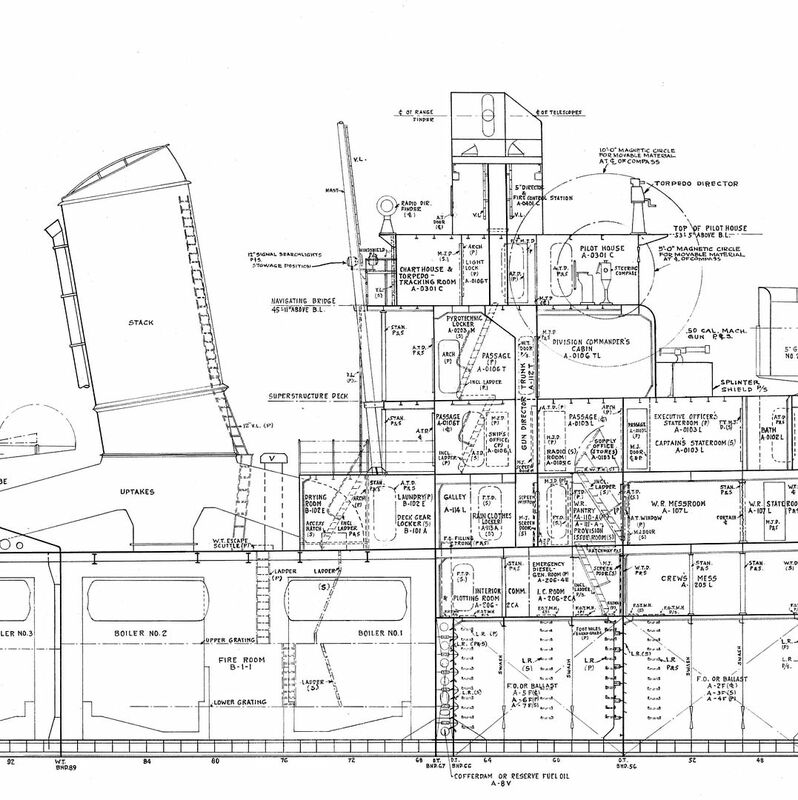 Also, when I can get around to showing the proof, I figured out that USS MUSTIN DID have four 20-mm guns on her aft deckhouse in the diamond pattern of one forward and on aft on the centerline and one on either side port and starboard. Also, when I can get around to showing the proof, I figured out that USS MUSTIN [b]DID[/b] have four 20-mm guns on her aft deckhouse in the diamond pattern of one forward and on aft on the centerline and one on either side port and starboard. Wow, it looks like the AA arrangement on Russell's after deckhouse changed yet again. If I have the progression correct, she started 1942 looking like Hughes, now got this arrangement with the 20mm tub sides extended aft, and by 1943 had an arrangement of 4 20mms there with (if memory serves) the little deckhouse atop the main deckhouse removed. That's one modified DD! Thanks for the photos, those are amazing.